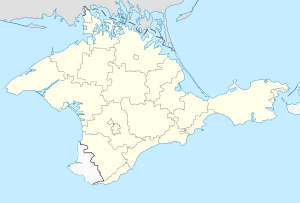 The Republic of Crimea (Crimean Tatar: Къырым Джумхуриети, Qırım Cumhuriyeti; Russian: Республика Крым, Respublika Krym) is a Russian federal subject. It is the Crimean peninsula in the Black Sea. It is located southeast of Ukraine and west of southern Russia. Its capital is Simferopol. The parliament of Crimea declared independence in 2014 after the victory of Euromaidan and joined Russia. ↑ "Crimea becomes part of vast Southern federal district of Russia". Ukraine Today. 28 July 2016. Archived from the original on 29 July 2016. Retrieved 28 July 2016. ↑ "Putin reveals secrets of Russia's Crimea takeover plot". BBC. 9 March 2015. Retrieved 3 August 2016. Crimea was formally absorbed into Russia on 18 March, to international condemnation, after unidentified gunmen took over the peninsula. ↑ "Autonomous Republic of Crimea". Ministry of Foreign Affairs of Ukraine. Retrieved 25 March 2014. ↑ "Order of Interior Ministry of Russia №316". Interior Ministry of Russia. Retrieved 11 April 2014. ↑ Для крымских автомобилистов приготовили новые номера. Segodnya (in Russian). 2 April 2014. Archived from the original on 6 July 2015. Retrieved 6 July 2015. ↑ "Crimea parliament declares independence from Ukraine ahead of referendum". Russia Today. March 11, 2014. Retrieved March 12, 2014. This page was last changed on 20 June 2018, at 03:38.